On June 26 2013 the JPO announced a revision of the examination standard regarding “Unity of the invention” and “Shift of Special Technical Features of the invention”. The revision will be applied to all applications examined from July 01 of the same year. As this revision relaxed the examination standard filing in Japan has become more convenient for applicants. Before the revision in the below example only claims 1, 2, 3, 7, 8 and 9 would have been examined. After the revision in addition to the above mentioned claims, claims 4, 5, 6 and 10 will be examined as well. 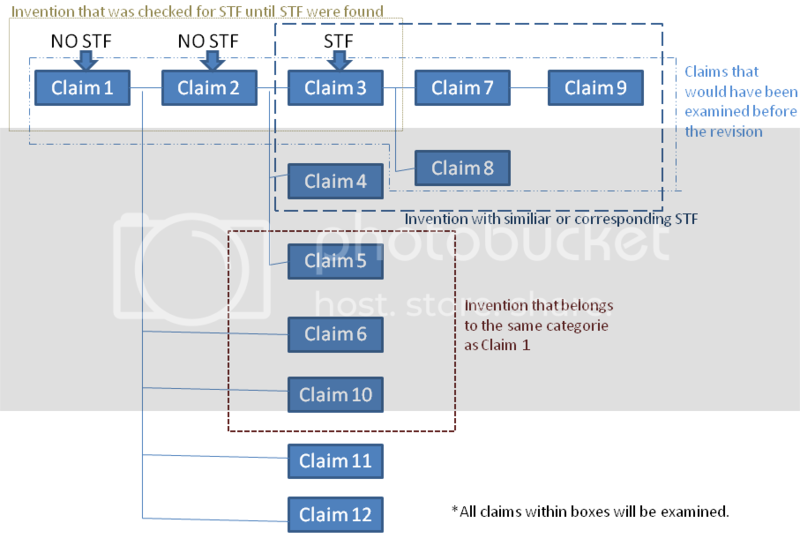 Claims that will be examined are chosen according to their “Special Technical Features (STF)” and the “efficiency of the examination.” As for the STF, “inventions that were checked for STF until STF were found” and “inventions with similar STF or STF corresponding to the STF found first” will be examined. As for the efficiency of the examination, subject matter that does not require additional prior art research will be examined. In general all inventions belonging to the same category and including all matters specifying the invention firstly mentioned in the claims (claim 1) will be examined. But claims with only little relation to the technical features and subject of claim 1 will be excluded. If your reader number is among these, please send us an email (info@asiapatent.net) with your name, firm name, reader number and address. Entry deadline: August 19, 2013.